Thanks so much for that feedback Marekbuk! I'm glad you were able to resolve the problem! Thank you Fred for supplying the solution! I added a note to the initial post regarding this. The EW is IMO notoriously difficult to tune. Marekbuk, do you have access to an oscilloscope? Setting a scope lead near the pitch antenna and tuning for the VFO tank inductor for maximum voltage will generally get you in the ballpark. I clip a short piece of wire to the scope lead to aid pickup, and keep it several inches away from the base of the antenna so as not to overly influence the operation of the EW. Thierry can help you from there. Glad you fixed the problem! My only (slight) concern is your use of screened cable - this will form a temperature dependent capacitor that could give a SMALL additional drift (only small - its at quite an insensitive point from the reference oscillator).. Also, the screen is a "ground wire" with large surface area, and care must be taken over the route it runs or it could affect more critical (sensitive) signals elsewhere. I tend to use extremely fine enameled copper wire (the stuff one uses to wind coils) for these kind of signals, as this has low capacitive coupling to anything else. I almost never use screened cable at the HF end. My advice would be to replace the screened cable with the thinnest wire you can find / use! Yes I have a scope - so to be clear the scope is picking up the oscillator signal but without being actually clipped to a physical point on the pcb? And picks up via the short wire? Thanks for the advice - I will replace the screened cable on Monday when I return to work - I have some thin enamelled wire. Yes, the voltage swing is quite high at the antenna so you'll be able to clearly see a sine wave on your scope by just bringing the probe within a few inches of the base of the antenna. A bit of wire on the probe helps with the pickup. You could use something like 24 gauge pre-tinned bus wire to make the internal connection. You want something that is small in diameter so the capacitance is low, yet rigid and solid enough not to vibrate and produce microphonics or otherwise move around. I replaced the screened cable with some 0.5mm enamelled wire, had a go with the scope but couldn't see the signal clearly enough to detect a max level of the oscillator. In the end I screwed down L5 and L6 fully clockwise and started from there. What a difference - before I was trying to tune when they were near the top of the inductor cases but now I can get a massive range max'ing out at around 3.5khz when touching the aerial. "... all I've got to do now is learn to play the 'beastie' :-)"
A local Thereminist wanted me to install either the ESPE01 or my YAEWSBM module in his Big Briar Theremin (a precursor to the Moog Etherwave standard). I'd installed ESPE01 modules in two of his other EW's, one a standard and the other a plus. He was out of ESPE01 modules and I wanted to update the YAEWSBM, so this seemed like a good time to kill two birds. As you can see, the collector supplies have have been bypassed with 1k / 0.1uF as recommended earlier in this thread by FredM. The emitter trimmer is gone, and the impedances have been lowered a bit. 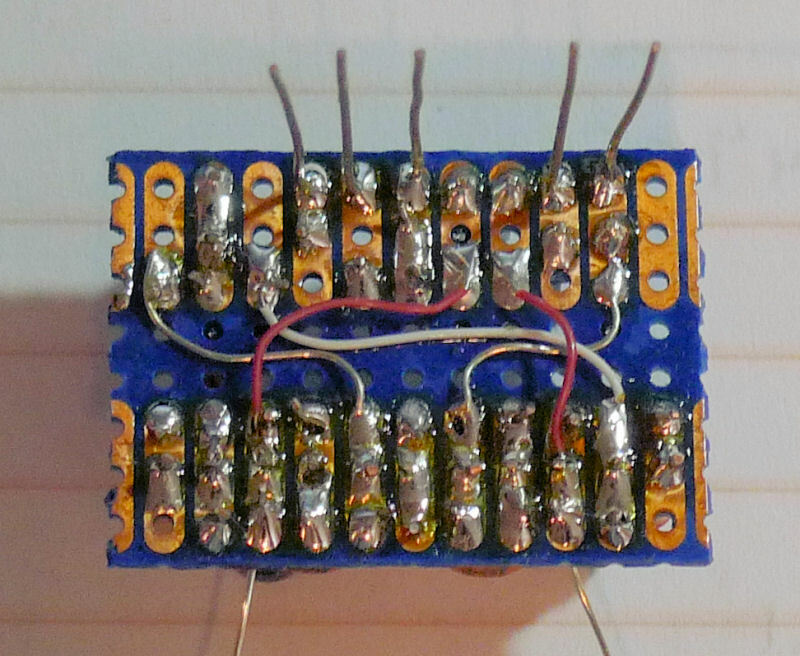 Since the header includes a connection to the mixer [AUDIO] I decided to replicate the mixing diode and 10k resistor on the YAEWSBM PWB, which increases the part count by 2 but gets rid of a jumper wire back to the main PCB. I used 26AWG tinned bus wire as the ground wire on the PWB, and as the fly wire connections back to the PWB. I used a bit stiffer 24AWG for the connections to the main PWB header. The colored wires are wire wrap. Steel wooled the copper clean, and used liquid rosin to give nice solder wetting. 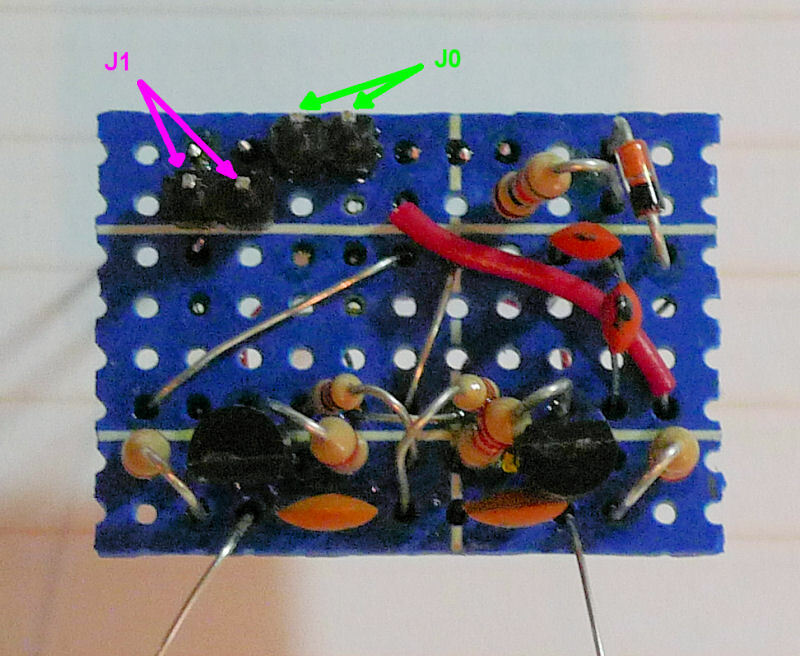 J0 is for a jumper, it shorts the transistor bases together to return the oscillator coupling should you want that. J1 shorts the header [VCA OUT] to ground, which bypasses the volume section and makes it a pitch only Theremin for tuning purposes and the like. And putting a DMM on J1 allows you to see the VCA voltage as a guide in aligning the volume side. Note the header at the upper right with [GND], [VCA OUT], [AMP IN], [AMP OUT], [-12V], [+12V], [AUDIO], and [AUX] pads. The YAEWSBM connects electrically only to the [GND], [VCA OUT], [-12V], [+12V], and [AUDIO] pads. Note also the arrow pointing to the cut in the wide power trace at upper left - I didn't do this, and I think it may have come from the factory this way. 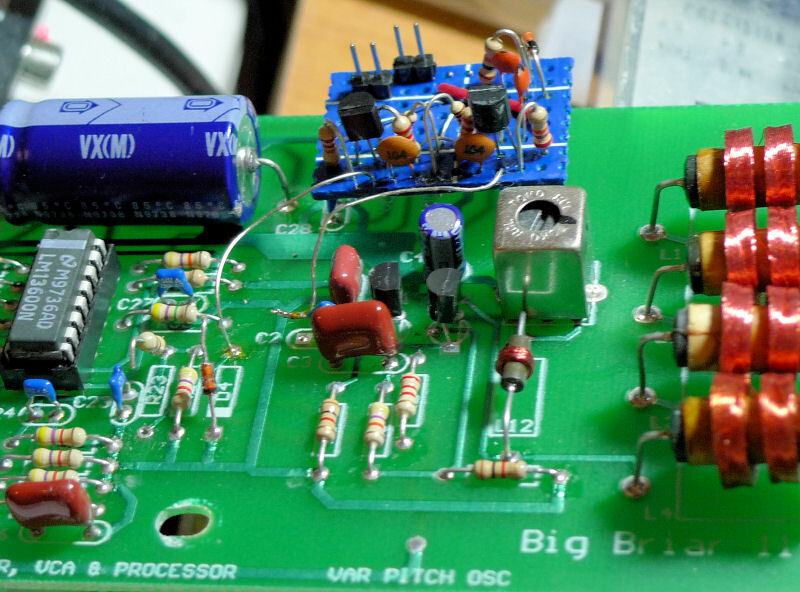 The Big Briar PWB is laid out a bit differently than the EWS, in particular the fixed oscillator capacitor C6 is located way over on the left side of the board. I decided it was easier to lift the near end of R23 and the far end of D4 (which are replicated on the YAEWBM board anyway) in order to isolate the C6 trace. 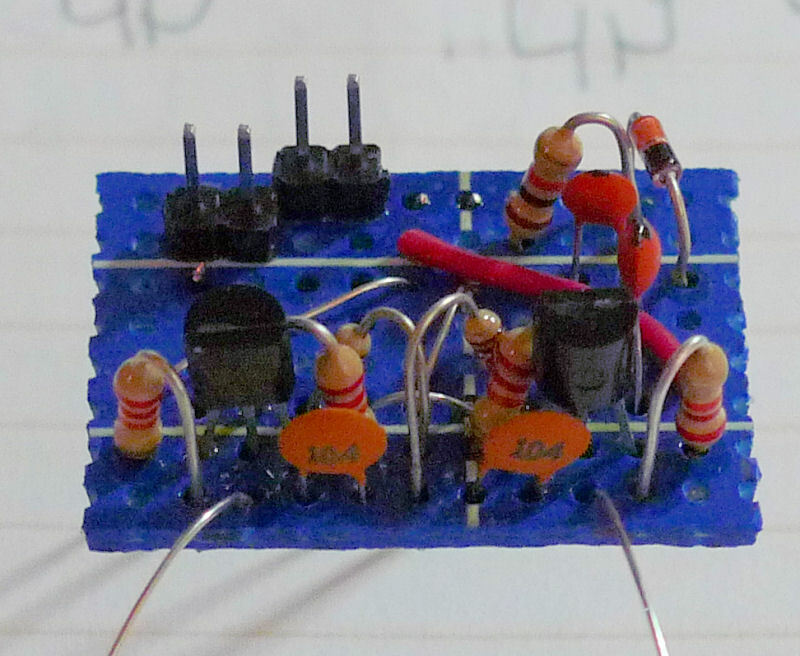 I lifted the left side of variable oscillator capacitor C2, which is hiding here right behind the center orange cap. The fly wires then go from the YAEWSBM to the open D4 hole, and the free end of C2. Installing the YAEWSBM v2.0 on an Etherwave Standard or Plus doesn't require the lifting of the resistor and diode, the main PWB mixer components won't interfere with the mixer on the YAEWSBM. Two more cuts in the PWB power traces at the arrows, and heavy gauge jumper wiring - from the factory? Also, look at the strange puckering of all the traces, I don't think I've ever seen anything like this on any PWB. The top side traces look fine. Weird. I checked the tuning before and after, and the module didn't seem to change it much at all. 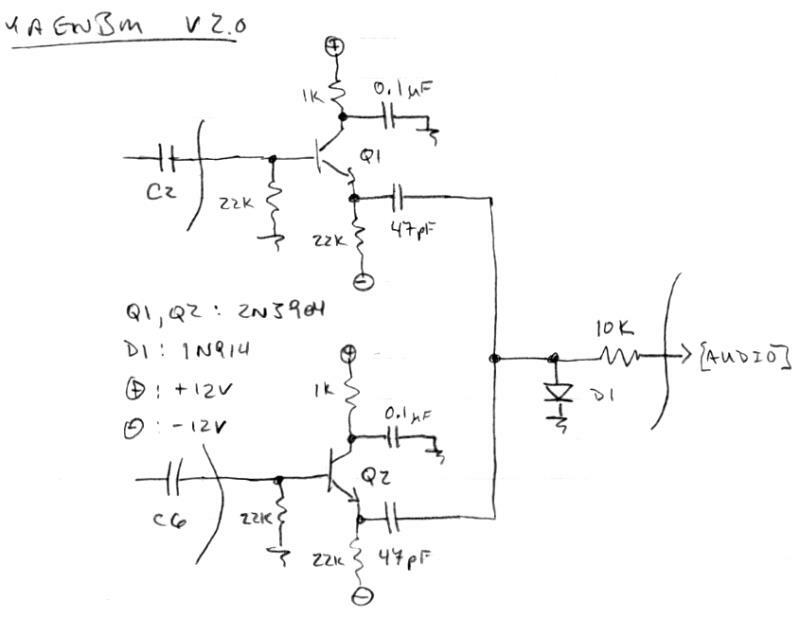 The Big Briar (BB) shares an almost identical schematic with the Moog EW, but it is really different to tune. I believe this is mainly because the EQ inductors are different. The EW schematic show 4 chokes per side, but all the ones I've seen opened up actually have 3 chokes. The BB has 4 chokes per side and doesn't seem to have the "jumping" resonance behavior the EW has. The BB also has slots in the ferrite adjustment rather than hex holes, so I had to fabricate a plastic tuning tool to tune the BB. Volume: I tuned the BB volume side with a DMM and by feel. The BB volume knob when fully CCW gives a large-ish field that doesn't really go to full volume. At fully CW the volume maxes out several inches from the antenna, and then reverses with increasing distance. In contrast, the EW volume side is much better behaved, with CCW giving a full range big field, and CW giving a full range small field, both monotonic. Pitch: I ended up turning L5 about 1/2 turn CCW from maximum antenna voltage. This gave a nice big pitch field with a bit less than an octave open/closed hand. Played around with tuning for about an hour, nothing I did could really change the linearity by very much. MODIFIED: samples 1, 3, 5, 7, 9, 11 = no; samples 2, 4, 6, 8, 10, 12 = yes. BRIGHTNESS: samples 1 thru 6 = 0%; samples 7 thru 12 = 100%. WAVEFORM: samples 1, 2, 7, 8 = 0%; samples 3, 4, 9, 10 = 50%; samples 5, 6, 11, 12 = 100%. Coupling profoundly changes the timbre of the low end, though it cramps up the far field too. Removing all coupling via buffering gives a more constant waveform throughout the range, which in a sweep can sound like a "roar" or "meow". I'm wondering if the re-introduction of just a bit of coupling might spice things up? Maybe a pF or two across J0, though I don't have the unit here to try that. Ideally (for the analog Theremin case) one would have the field smoothness of no coupling with optional adjustable richer timbre that coupling brings.